Perfect summer rental! Available from Memorial Day to Labor Day for $35,000. Located only one block from the beach this five bedroom, three bathroom home with private parking has more than enough space to fit your all your summer needs. Upon entering this home you walk right into an open floor plan that is surrounded by windows on all sides and has an abundance of sunlight. There is a large, eat-in country kitchen, formal dining room and a large sunny living room. The dining room, which can easily seat 12, has sliding doors that lead out to your beautifully landscaped backyard which is the perfect spot for summer BBQs. The large living room is accented with pretty built ins, a fireplace and has access to a bonus room in the front of the home that is surrounded by windows. This floor also includes a full bathroom, large bedroom and a washer dryer. The second floor of this home features four nice sized bedrooms, two full bathrooms and a huge room that can be used as another living area/media room/playroom/office etc. This room is features with a large bay window and a bright sky light. 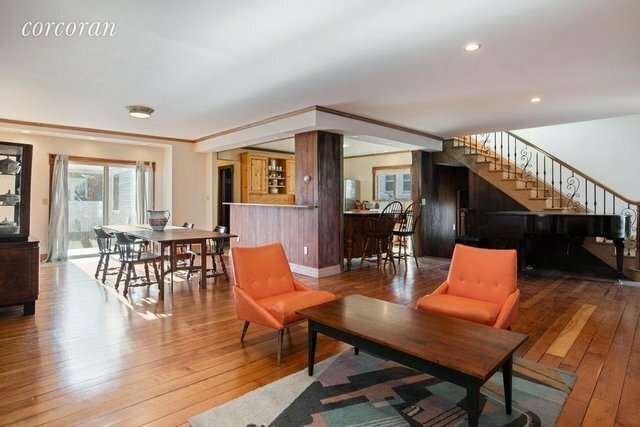 In addition, this home is highlighted with gorgeous wide planked hardwood floors and beautiful moldings. Only a 45 minute drive or a short ferry ride to Manhattan and a quick walk or bike ride to the boardwalk at Riis Park and Rockaway Beach, this Neponsit home would be your perfect summer getaway at the beach!